As Vikram lifted Betal on his shoulders once again. Betal told Vikram another story. Once, there lived a woodcutter who was very hardworking but poor. He asked a sage, "Will I ever become rich?" The sage read his palm and said, "No matter how hard you work, you will never become rich. If you become rich, you will die." 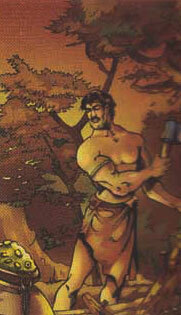 The woodcutter was disheartened, but he continued to work hard. One day, he found a pot of gold in the forest. He remembered the sage's prophecy but thought , "One day everyone has to die, and it is no use leaving this pot here. "He took the gold with him and used it to help the villagers. He did not die early and lived a long life. Betal asked Vikram, "Was the Sage's prophecy wrong?" Vikram replied ,"No Since the woodcutter did not spend the gold on himself, he was not actually rich and therefore he did not die." Betal said, "Very good, but I have to go."